Bill Eagleburger, 82, of Kansas City, MO passed away December 21, 2018 at home. Funeral services will be held at 10:00am, Friday, December 28, 2018 at Abundant Life Church, Lee’s Summit, MO. Graveside services will follow the funeral service at Brooking Cemetery, Raytown, MO. Visitation will be held from 6:00-8:00pm Thursday, December 27, 2018 at Abundant Life Church, Lee’s Summit, MO. Mr. Eagleburger was born May 23, 1936 in Marshfield, MO. He was preceded in death by mother and father, Lema and Orville, wife Donna, siblings; Glen Eagleburger, Dennis Eagleburger, Kathryn Kelly, Charles Eagleburger, Zela Ramey, and Sue Mallard. Survivors include siblings; Dean Eagleburger, Don Eagleburger, Lloyd Eagleburger, Shirley Farrell, Larry Eagleburger, and Max Eagleburger, children Bruce and Gayle Eagleburger, and Brent and Caren Eagleburger, grandkids; Kent and Megan Eagleburger, Megan and Ryan Ruble, Whitney Eagleburger, Mallory Eagleburger-Stewart, Blake and Hannah Eagleburger, Morgan Eagleburger and James Eagleburger, and great grandkids; Maellee, Luke, Carson, Mack, and Grant. Memorial contributions may be made to Children’s Miracle Network Hospitals of KC. Bill, you will be missed by the Kansas City Fire Dept. personnel. It isn’t until people have passed that we realize what a blessing they were in our life because of the void we now have in our hearts. Those who truly took the time to get to know Bill understood his desire to do what was right and how deeply he cared for his family. My deepest sympathy to his family and may the peace of God which is beyond understanding comfort you doring your time of loss. God Bless! Bill, You brought peace to the workplace and friendship to those around you. You made me smile as we brought new technology to you and you brought paper and pencil along with practical solutions. I miss you my friend. May the healing hand of God touch your family in your loss. You were a kind and loving man which we felt in your actions. My prayers go out to the family and it was pleasure knowing you. You will be truly missed. You always had a smile and a kind word for everyone that crossed your path. It was such a pleasure to work with you regarding procurement and the daily challenges. My prayers go out to the family and may God provide peace to you at the your loss. God Bless! Bruce, We are so sorry about the loss of your father! You and your family are in our prayers! The best BOSS a person can every every have . He really care about everybody and I care about him . A every special man in heart is will be miss . RIP Bill because I know u can a will . One very fine Man. Left a great Legacy behind. Condolences to you All. Absolutly LOVED the video! Can’t say enough good things about Bill. I worked side by side with him for over 12 years and he was the finest Supervisor a person could work with/for. Always caring and concerned for the people around him and striving each day to do the ‘right’ thing for all. And, yes skip the computer, he could work wonders with a Big Chief tablet and a pencil. He made the ‘Shop’ a great place to work. He will be sorely missed by his ‘City Family’ as well as his own close family. Prayers of peace and comfort to the entire Eagleburger family. Bill was a wonderful man, I know he will be terribly missed by all that knew and loved him. Taking comfort in the fact we’ll see him again some day and remembering his amazing legacy that will keep him alive in their hearts. Brent and Bruce, and your families. Our deepest sympathy and Condolences. Your dad was all about family included everyone around him. Awesome Tribute for your father. There I see continued family tradition and love. Our prayers for comfort in your loss but at the same time Celebrating the great life your parents had. May God Bless you all. Your in our prayers here in Texas. Dear Bruce and Brent, I just found out about the passing of your Dad while at church speaking to his neighbor Larry Higgins. I am so sorry to hear this. We know however that as believers, we will see him again! He was a great man, kind and considerate. I enjoyed hearing his stories. I remember him working at Dart truck company. The last time I saw him, he was mowing the parkway off of Paseo Blvd at around 55th Street, that was several years ago. Dear Bruce and Brent and family, What can we say other than we are in shock… We hadn’t spoken with your dad for several months, I picked up my phone today to give him a call just to check in with him and to see how life has been treating him. To my surprise, his number was not a working number. For some reason, in my heart I knew he was gone… I looked up his name and my heart came crashing to a halt. Let’s just say, your dad was such a wonderful and amazing man, and a friend to myself and my husband. He was the truest example of how a man should live his life… always family first! He spoke very fondly of his children and grandchildren. He was very proud of all of your accomplishments! 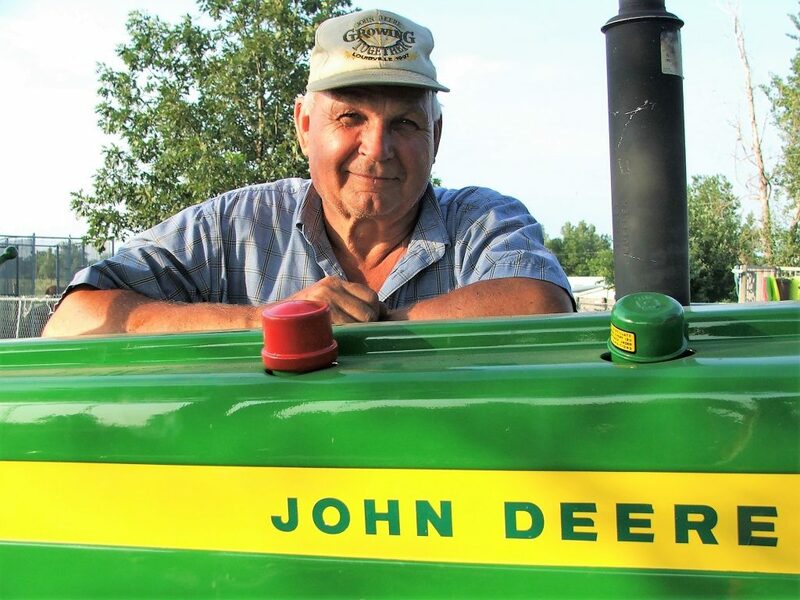 He loved showing us his tractors and loved even more that he was able to share his love with the grandkids. What a treasure you had in a dad, grandpa! His legacy of friendship, is truly one that will be hard to live up to. With a saddened heart, Jania and Terry Elmer.